It is not customary within Catholic tradition to leave Holy Mass immediately after receiving Holy Communion, but to await to be dismissed after the final blessing. A ‘fast food’ mentality isn’t an appropriate approach to receiving Jesus in the Blessed Sacrament. Please consider what happened to the first person who left the ‘first’ Mass early - read John 13:30. Tuesday night parish catechesis resumes on Tuesday 11th July in the Parish Centre at St. Margaret Mary from 7.30 pm. The next unit of study focuses on the Mass in Scripture. Please sign up to enable resources to be ordered. Please consider coming along. Please continue to support this worthy initiative through contributing and putting your offerings in the basket at the back of Christ the King. If we could supply especially UHT milk, rice pudding, custard, tinned fruit, pasta sauce. High Protein food such as tinned meat, tuna etc are also much appreciated. Once again St Margaret Mary SVP will be delivering food parcels to local families in need before the start of the school summer holidays. We aim to deliver parcels the week beginning 10th July. Tinned fruit and meat are especially needed. Thank you once again for your support. This will take place between 26th to 29th Sept 2017 at a cost of £265. For more details, please call Paul Briers on 01946 834834. Please think about assisting at Holy Mass during the week, particularly to pray for peace and an end to terrorist atrocities. Please consider praying the Holy Rosary each day for peace. Did You Attend St. Cuthberts? St. Cuthbert's Primary School wish to establish a ‘Friends of St. Cuthbert's Association’ to help strengthen school/parish links. For more information, please contact the school on 01228 818201. Over the coming weeks, a number of references to Health and Safety will be made in the parish newsletter, for example drills in the event of a fire. Please read and take note of this important information. 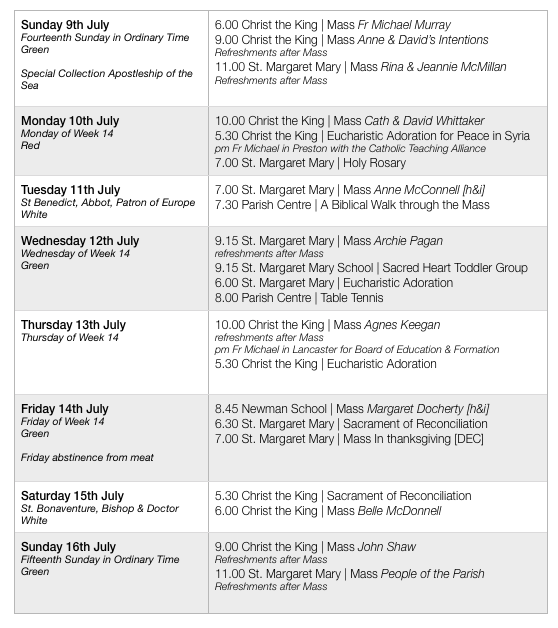 As Fr Michael mentioned we hope to have St. Margaret Mary open for personal prayer on weekdays….from September? If you would be willing to become a ‘porter’ to open and close the church, please contact Fr. Michael. This week our schools break up for their summer holiday. We wish the staff and students a happy holiday period. Going to University in the Autumn? Most of our Universities and Higher Education Institutions have a dedicated Catholic Chaplain based in the university or the local parish. The Catholic Chaplaincy is a place for you to explore your faith as a young adult, to meet other young people with similar interests from a great range of backgrounds and to get involved in activities and social outreach. If you already have a strong faith, this is a chance to deepen it. If you are full of questions and doubts, this is a chance to share them and search for some honest answers about life and faith. Everyone is welcome. To find your local Chaplaincy and for contact details of all the University Chaplains and Catholic Student Societies, visit the Catholics at University website at: www.catholicsatuniversity.org.uk. To mark the 500th anniversary of the Reformation, The Society of St Gregory Summer School is holding this residential at Hyning Hall, Leeds from 26 – 29 July 2017. For further information, visit: www.ssg.org.uk. Allen Hall Seminary in Chelsea offer comfortable rooms in central London in July and August. Beautiful gardens and chapel. Rooms from £50 per night (including breakfast). Website: www.allenhall.org.uk; email: allenhall@rcdow.org.uk or telephone: 020 7349 5600 (option 0). Bishop Campbell has announced the merger of St. Edmund’s and St. Bede’s Carlisle. The new merged parish is known as ‘The Cumbrian Martyrs’. 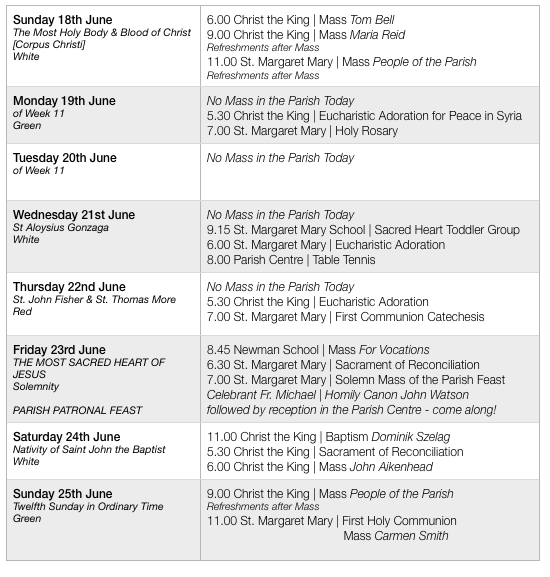 Carlisle now has four parishes; The Cumbrian Martyrs [formerly St Bede and St. Edmund], Our Lady of Eden [formerly Our Lady & St. Joseph], The Sacred Heart of Jesus [formerly Christ the King and St. Margaret Mary] and St. Augustine [as yet unchanged]. Congratulations to Fr. Daniel Etienne who was ordained to the priesthood at Lancaster Cathedral on Saturday 1st July. We wish him many happy years of service to the people of God in the Diocese of Lancaster. Any boys and men wishing to join the serving teams at Christ the King and St. Margaret Mary would be most welcome to join. Please have a word with Fr Michael. Readers are always needed in the parish. Anyone wishing to help in the proclamation of the Word of God at Mass, please have a word with Fr. Michael. This year falls on Sunday. On Saturday 5th August, we welcome a choir from the Royal Schools of Church Music during the evening Mass. Come and find all that God has prepared for your masculine heart. Inspiring & challenging talks, fellowship & sharing with other Christian men, walking in the Lake District and much more. Saturday 15 - Sunday 16 July, Cor et Lumen Christi, Wigton CA7 9HU. Donation only event. To book or for more information: visit www.coretlumenchristi.org, phone 016973-45623 or 07516-075896 or email stcuthberts@coretlumenchristi.org. ksccouncil60@gmail.com (ksccouncil60@gmail.com) or tel: Paul on 07788 818535. Self catering, animals and children welcome but must be supervised at all times. As Fr Michael mentioned, we hope to have St. Margaret Mary open for personal prayer on weekdays….from September? If you would be willing to become a ‘porter’ to open and close the church, please contact Fr. Michael. The annual pilgrimage to Ladyewell, the Shrine of our Lady and the Martyrs, is being held on Saturday 8th July 2017, from 11.00 am to 2.00 pm, led by Bishop Michael Campbell, OSA. For further details, please contact: (01772) 700181 or email: admin@ladyewellshrine.co.uk. 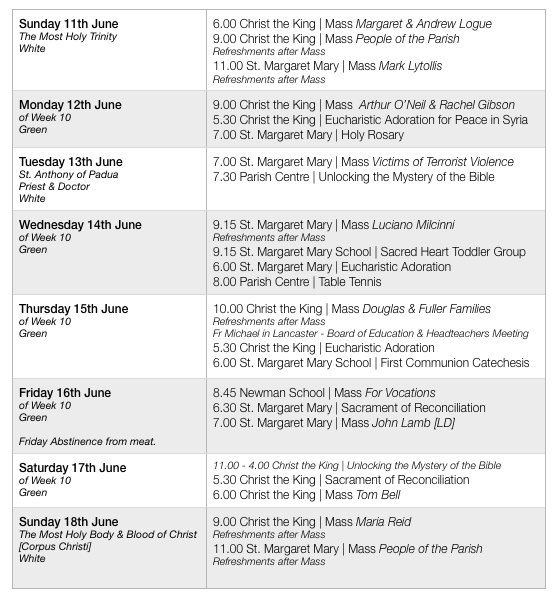 Fr Michael is away this week. He is a member of the Priestly Society of the Holy Cross, part of which involves an annual study week, which he is attending. It’s important to remember that priests need to continue their vocational training even after ordination, as well as receiving spiritual support from other priests. Please keep him and the other priests attending in your prayers this week. Fr Norman will be covering next weekend. Tony and Anne Parrini are opening their garden at Hamethwaite, Rockcliffe CA6 4AB, on Saturday 8th July from 2.00 pm to 5.00 pm. Proceeds will be donated to the Rotary Foundation (Polio Eradication) and the RNLI to purchase replacement kit lost in the Carlisle Floods. Tickets cost £5 (Children £2) in advance or pay at the door on the day. For further details, please contact Tony or Anne on 674553. Churches Together in Cumbria is offering its day of reflection: what does scripture say about conflict? how do we respond to conflict in faith? Tuesday 4th July from 9.30 am-4.00 pm, at the Quaker Meeting House, Penrith. Participants are asked to take your own lunch, a Bible and paper. Tea, coffee, cake and fruit will be provided throughout the day. £10 per person. See the poster in the foyer. For more information, please contact Brec Seaton: seatonb@methodistchurch.org.uk. To book and pay, contact Helen Boothroyd: hbctic@tiscali.co.uk or 07503-931196. There were 47+52+326 = 425 at Mass last weekend. Thank you for your offering of £324.00 and £440.21 = £764.21. It is not customary within Catholic tradition to leave Holy Mass immediately after receiving Holy Communion but to await to be dismissed after the final blessing. A ‘fast food’ mentality isn’t an appropriate approach to receiving Jesus in the Blessed Sacrament. Please consider what happened to the first person who left the ‘first’ Mass early - read John 13:30. Thank you to all who attended our Feast Day celebration on Friday and to those who helped out in any way. Thank you to all who assisted at the First Holy Communion. Special thanks to our catechists who have prepared the children for the celebration. Parishioners are welcome to join the school for the celebration of Holy Mass on Friday mornings. For information on how to access the room used for Mass, please have a word with Fr. Michael. This will take place between 26th to 29th Sept 2017 at a cost of £265. For more detail, please call Paul Briers on 01946 834834. On Wednesday, 19th July at 7.00 pm in St. Margaret Mary's Parish Centre, the celebrity Chef John Crouch will be cooking an Indian 3 Course Dinner. Tickets £10. See Liz Sproat for tickets. We have recently received the figure from the Diocese for this year. The amount we have been asked to contribute to Diocese is £12,425,04 which is paid in 10 equal monthly instalments. This figure is calculated at 23.5% of parish income [rent and offertory income] for the financial year ending 5th April 2016. We recently received a dividend of £264 for investments we hold with the diocese [currently standing at £12,225]. Diocesan Pilgrimage to Lourdes - Help! Although two of our young parishioners will be attending, the diocese is eager that more young people attend the pilgrimage. If you are 16 or over and would like to attend, it is not too late. Speak to Fr. Michael as soon as possible. Carlisle Renewal Days – monthly days of worship, prayer and praise. The next date is Saturday June 24th and will be held at St Edmund’s Church, Orton Rd, Carlisle. All welcome. Renewal days start at 11.00 am and finish around 4.00 pm. Please join us even if you cannot stay for the full day. Tea and coffee will be provided but please bring a contribution to a shared lunch. Contact Janice Wrench –on 01768 868489. Come and find all that God has prepared for your masculine heart. Inspiring and challenging talks, fellowship and sharing with other Christian men, walks in the Lake District and much more. Saturday 15 - Sunday 16 July, Cor et Lumen Christi, Wigton CA7 9HU. Donation only event. At High Wray Bank on the shores of Lake Windermere from 14th —16th of July 2017. £20.00 a pitch camping, vans and caravans. ksccouncil60@gmail.com (ksccouncil60@gmail.com) or call Paul on 07788 818535. Self catering, animals and children welcome but must be supervised at all times. 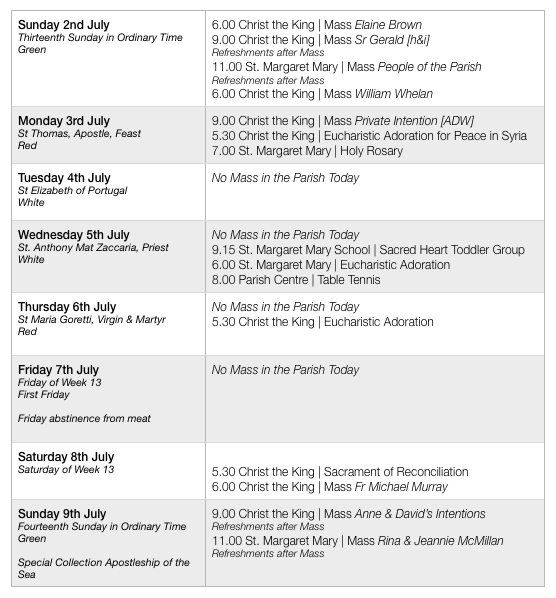 As Fr Michael mentioned, we hope to have St. Margaret Mary open for personal prayer on weekdays….from September? If you would be willing to become a ‘porter’ and open and close the church, please contact Fr. Michael. Thanks to all who attended this course in recent months. Watch this space regarding the next course ‘The Bible Timeline’ which will begin in September. During the month of May a wide range of second hand books are on sale at the back of St. Margaret Mary. The purchase is simple: make a donation and take as many as you want - if you don’t want any, then make a donation and then take some to a charity shop. Funds raised will go towards helping Will and Robbie meet their costs for the Diocesan Pilgrimage to Lourdes. So far £100 has been raised from the Book Sale - thank you. June is the month of the Sacred Heart. Our Patronal Feast will be celebrated on Friday 23rd June with a Solemn Mass at 7.00 pm followed by a Buffet Reception in the Parish Centre. Newman School will be providing some music during the reception. The Wordsworth Singers will be joining us again this year - the Mass they will sing will be Tomas Luis de Victoria’s Missa O quam gloriosum with the Motets O quam gloriosum and Ego sum panis vivus. Please invite family and friends to come along and make a real effort to be there. Will be celebrated during the 11.00 am Mass at St. Margaret Mary on Sunday 25th June. Thank you to our team of catechists - Ann, Eileen, Eileen and Catharine - who have helped prepare the children for this and to St. Margaret Mary Catholic Primary School who have provided a venue for the lessons and for supporting the children. On Wednesday, 19th July at 7.00 pm in St. Margaret Mary’s Parish Centre, the celebrity Chef John Crouch will be cooking an Indian 3 Course Dinner. Tickets £10. See Liz Sproat for tickets. There were 76 + 82 + 105 = 263 at Holy Mass last weekend. The offertory came to £391.20 + £211.28 = £602.48. Thank you for your contribution. We have recently received the figure from the Diocese for this year. The amount we have been asked to contribute to Diocese is £12,425,04 which is paid in 10 equal monthly instalments. This figure is calculated at 23.5% of parish income [rent and offertory income] for the financial year ending 5th April 2016. We recently received a dividend of £264 for investments we hold with the diocese [currently standing at £12,225]. St. Cuthbert's Primary School, wish to establish a ‘Friends of St. Cuthbert's Association’ to help strengthen school/parish links. For more information, please contact the school on 01228 818201. Although two of our young parishioners will be attending the diocese is eager that more young people attend the pilgrimage. If you are 16 or over and would like to attend, it is not too late. Speak to Fr. Michael as soon as possible. The Extended Family of the Religious of the Sacred Heart of Mary [RSHM St. Gabriel’s Sisters] invite you to join them in the Waterton Hall on Saturday 24th June for a talk on the Cenacolo Community given by Fr Christopher Loughran. Coffee will be served at 10.45 am. Bring food for a shared lunch. The gathering will start at 11.00 am and finish by 2.00 pm approximately. Please think about coming to what we know will be an enlightening talk about the work of this community. For further information, please contact 01228 562756. Carlisle Renewal Days – monthly days of worship, prayer and praise. The next date is Saturday June 24th and will be held at St Edmund’s Church, Orton Rd, Carlisle. All welcome. Renewal days start at 11.00 am and finish around 4.00 pm. Please join us even if you cannot stay for the full day. Tea and coffee provided but please bring a contribution to a shared lunch. For further information, please contact Janice Wrench on 01768 868489. Come and find all that God has prepared for your masculine heart. Inspiring & challenging talks, fellowship & sharing with other Christian men, walk in the Lake District and much more. Saturday 15 - Sunday 16 July, Cor et Lumen Christi, Wigton CA7 9HU. Donation only event. Fr Michael is in Assisi between Monday and Thursday this week leading the Diocesan Education Service Headteachers’ Pilgrimage. He will offer Mass for parishioners on the tomb of St. Francis at 8.00 am on Tuesday. During the month of May a wide range of second hand books are on sale at the back of St. Margaret Mary. The purchase is simple: make a donation and take as many as you want - if you don’t want any then make a donation and then take some to a charity shop. Funds raised will go towards helping Will and Robbie meet their costs for the Diocesan Pilgrimage to Lourdes. June is the month of the Sacred Heart. 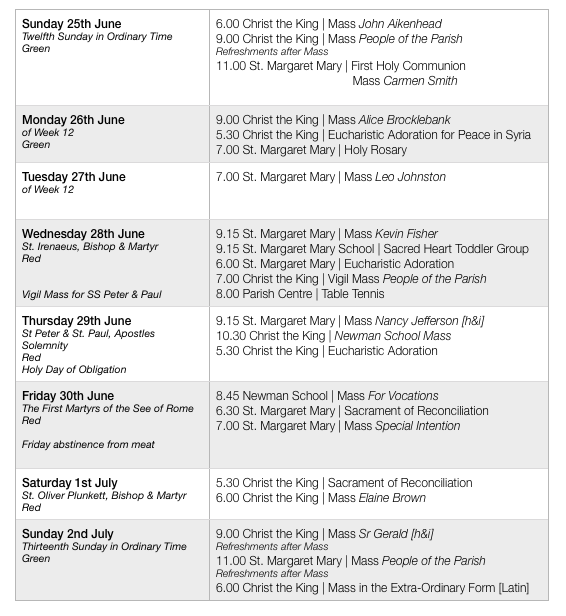 Our Patronal Feast will be celebrated on Friday 23rd June with a Solemn Mass at 7.00 pm followed by a Buffet Reception somewhere afterwards… Newman School will be providing some music during the reception. The Wordsworth Singers will be joining us again this year - the Mass they will sing will be Tomas Luis de Victoria’s Missa O quam gloriosum with the Motets O quam gloriosum and Ego sum panis vivus. Please invite family and friends to come along and make a real effort to be there. Parishioners are welcome to join the school for the celebration of Holy Mass on Friday mornings. Please have a word with Fr. Michael for information on how to access the room used for Mass. This will take place between 26th to 29th Sept 2017 at a cost of £265. For more details, call Paul Briers on 01946 834834. On Wednesday, 19th July at 7.00 pm, in St. Margaret Mary's Parish Centre, celebrity Chef John Crouch will be cooking an Indian 3 Course Dinner. Tickets £10 each. See Liz Sproat for tickets. There were 67 + 82 + 102 = 251 at Holy Mass last weekend. The offertory came to £402.00 + £350.86 = £752.86. Thank you for your contribution. There will be another ‘intensive’ viewing of this powerful series on Saturday 17th June 2017 between 11.00 am and 4.30 pm for those unable to attend previously. Music by Palestrina & Poulenc will be celebrated in the Carlisle Cathedral on Saturday 17th June 2017 at 7.30 pm (pre-concert talk 7.00 pm). Tickets: £15 - £25. National Box Office only - 01904 651485 / tickets.ncem.co.uk. We have recently received the figure from the Diocese for this year. The amount we have been asked to contribute to Diocese is £12,425,04, which is paid in 10 equal monthly instalments. This figure is calculated at 23.5% of parish income [rent and offertory income] for the financial year ending 5th April 2016. We recently received a dividend of £264 for investments we hold with the diocese [currently standing at £12,225]. St. Cuthbert's Primary School wish to establish a ‘Friends of St. Cuthbert's Association’ to help strengthen school/parish links. For more information, contact the school on 01228 818201. Our diocesan youth retreat centre, Keswick, has a vacancy for a retreat leader. The team are looking for a practising Catholic who can lead retreats for young people and is excited to proclaim the Gospel to young people and support them as they grow in faith. Deadline for application, 19 June. For more information, www.castleriggmanor.co.uk/team-vacancies or phone Fr John Moriarty on 017687-72711.